Maria Pia Bridge is one of the most iconic if not the most, bridges in the Oporto city. It is a railroad bridge between the city and it’s neighbor counterpart Vila Nova de Gaia. 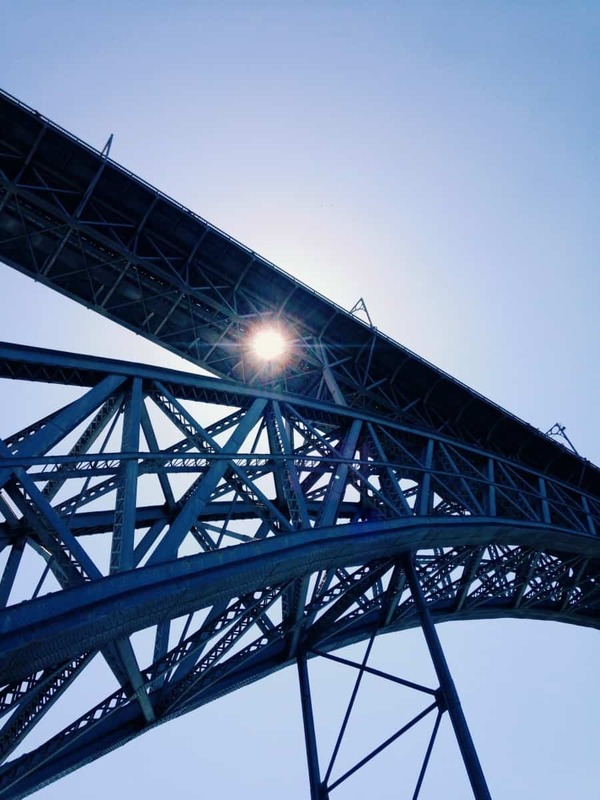 Considerered by many as one of the most beautiful bridges in the city, with an image immediately identified, even if stylized, making it one of the Oporto love brands. From the beginning and throughout the centuries, Oporto and Gaia always had the necessity to communicate and create a proper system for the transport of goods and materials from one city to another. Despite the vicinal nature of the two places, the Douro river was a natural barrier that had always to be surpassed in order to have a proper transport system. From the very beginning, the transport by boat or in small rafts was preferred , if not, the most quick and efficient, due to margin to margin proximity. In the 18th century, the transport by boat from Oporto to Gaia and vice-versa was already present in a normal transport schedule. It’s precisely in the 18th century that references to something close to a bridge start to appear in the literature, “A ponte das Barcas”. From written testimonies of those days, the Barcas bridge was in fact a resemblance of a true bridge since it was a structure supported by 20 rafts side by side and anchored to the bottom of the river. Above the rafts and fixed to them, a wooden stage provided the safe passage to the other margin, of people, merchandise and goods. As a flexible bridge, the adaptiveness of the structure was tremendous, it could be reset, open to allow the crossing of other boats and following the tides with no difficulty. By the times of the second French Invasion, in 29 March of 1809, a scared and afraid population ran to the Balsas bridge trying to escape the French invaders. A disaster then occurred, as the bridge became overloaded with the running population and eventually breaks, setting a sad fate for approximately 4000 people trying to escape and ended up in the Douro river, drowning in the speedy waters. This event is still remembered today as “Desastre da ponte das Barcas” , a tragedy for the city. The population, despite the fears awakened by the disaster, were already accustomed to cross the margins and, a new solution to the river crossing was started to be evaluated and with better security. Despite this, two more bridges like the Barcas were built until 1843. Construction of a new bridge was therefore needed and after project approval the works started in 2 of May 1841 and lasted until 1842. Conceived by Stanislas Bigot and, José V. Damásio, the bridge was built precisely to provide safe transportation. The Ponte Pênsil was inaugurated in 17 February 1843, by the time for the great floods and the decommissioning of the Barcas bridge. Interesting is the fact that the Pênsil bridge was called D.Maria II (in honor of the queen coronation anniversary), the name was never adopted. Although built for safety, the bridge was always considered unsafe to the common people, who looked at it with suspicion after the first day in use. The vibration of the structure was very intense and not a good safety sign. Although these allegations were in contradiction with the stress load tests performed by the responsible team in charge of the works. It was a structure with a span of 155 mt between margins and a total length of ca. 170 mt, suspended by eight iron cables anchored in masonry pillars 18 mt tall and, a wooden platform. The pillars are still visible today in the Oporto side and represents the only signs of existence of the D.Maria II bridge. Safety considerations aside, the Pênsil bridge stayed in service for 45 years. By then, a new and gigantic structure would rise. Douro river crossing was made mostly by boat and by the use of the existing bridges but, a new reality was starting to gain more and more strength , the railroad. The extension of the north railroad line system to Devezas, did not cope to the growing commercial demand between Oporto and Gaia, so, a solution was to build another bridge but this time a railroad bridge, capable of satisfy that same demand. In 1875 the Royal Railroad Company (today CP)launched an international contest for the construction of a bridge connecting the existing north railroad line to the Oporto city, by crossing the Douro river. Lisbon and Oporto would then be connected by rail and the commercial opportunities and consequences that would come from this would be tremendous, not only from the commercial point of view, but also to the city itself and habitants. That contest gathered 4 proposals for a very demanding and challenging project, conditions imposed by the river itself and, by natural configuration of the riverbed. The winning proposal went to Gustave Eiffel (and Théophile Seyrig, Eiffel’s business partner and considered responsible for the bridge design ) with a project cost of 965.000 Fr, making the proposal the cheapest between all four. Beginning of construction started at 5 January 1875 and were concluded by 1 October 1877. Works continued however until 30 October 1877, with the mounting of complementary structures. 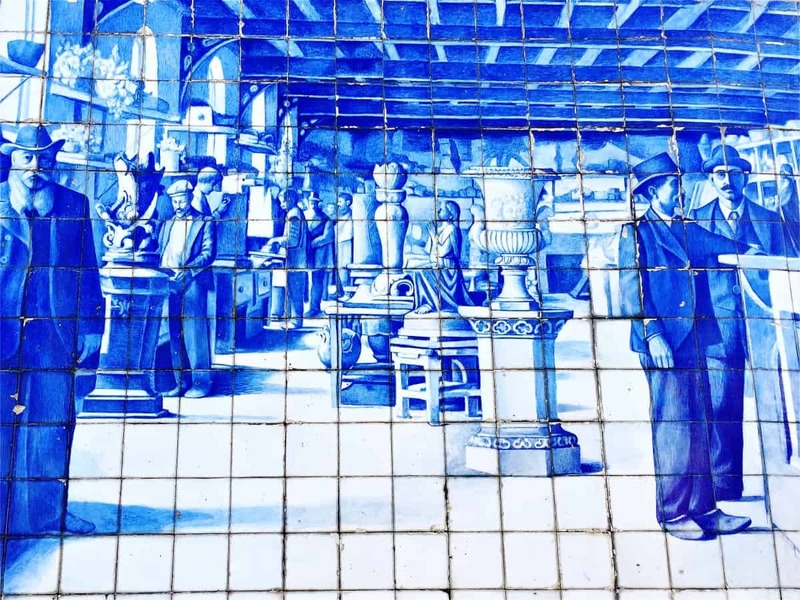 In the first days of November that same year, performance tests were made and the official inauguration took place at 4 November 1877 with more than a thousand guests arriving in a special train of 24 wagons leaving the Vila Nova de Gaia side. After that first train, the royal train followed, with the presence of the King D.Luís I and the Queen Maria Pia (naming the bridge after her). Celebration of the event lasted three days , reflecting the state of joy and hope that this new rail connection would bring to the city and to commerce. 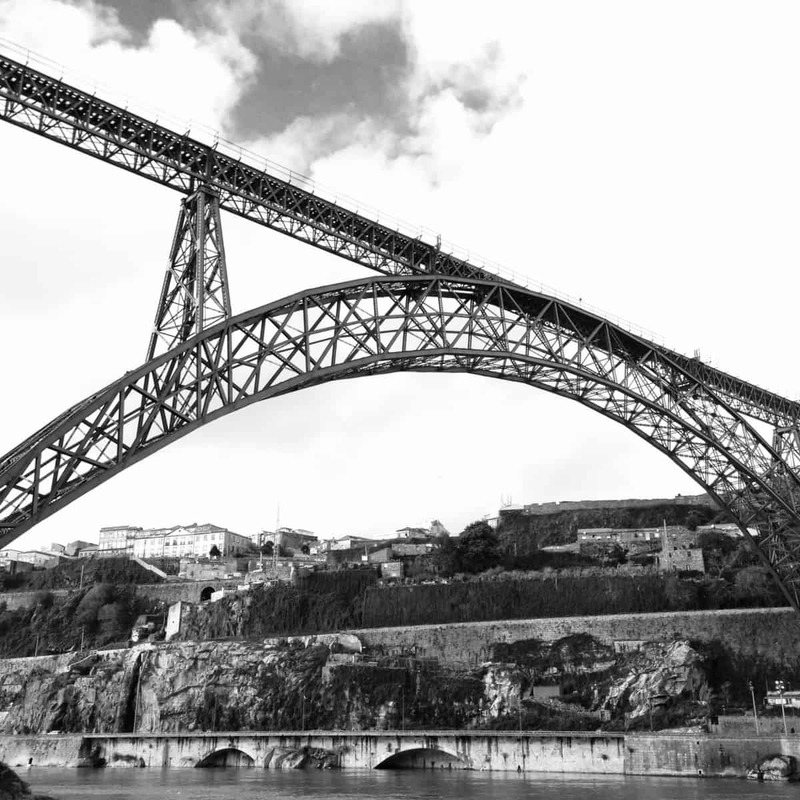 Maria Pia bridge was an architectural achievement with no matching pair in Portugal by that time. With a deck size ca. 355 mt, Maria Pia bridge connects the mount of Seminário in the Oporto side and Serra do Pilar on the Gaia side. It has three supporting pillars on one side (Gaia) and two others on the other side (Oporto). The central arch has a span of 160 mt (assisted by two secondary pillars) and with a 42,6 mt rise above the river. Construction was technically very demanding and Eiffel used the latest engineering solutions to achieve his work on the Maria Pia bridge. A good sign of that, is the construction of the central arch itself. Impossible to achieve by standard construction methods, the arch was built from the abutments on each of the river margins and supported by cables attached to the pillars that gave support to the deck. The bridge support pillars are anchored in massive granite masonry blocks. Limitations concerning useful velocity in the bridge and the fact that it was a single way become very evident in late 20th century. Speed velocity was the major limitation factor, delaying tremendously the crossing of the river by train. Along this, severe weight limitations also existed and therefore some of the railroad rolling stock were not allowed in the structure. The continuous evolution in number of passengers made evident the bridge vulnerabilities and weaknesses. Maria Pia bridge operated during 114 years and it was permanently decommissioned in 24 June 1991. The bridge is classified as National Monument by the DGPC and remains the most recognized bridge and symbols of the Oporto city. Several projects are being studied in order to bring back this beautiful bridge to good use but until now little has been done.